Renowned mentalist Lior Suchard has mystified audiences all over the world with demonstrations of his phenomenal gifts of mind reading, thought influencing, and telekinesis. 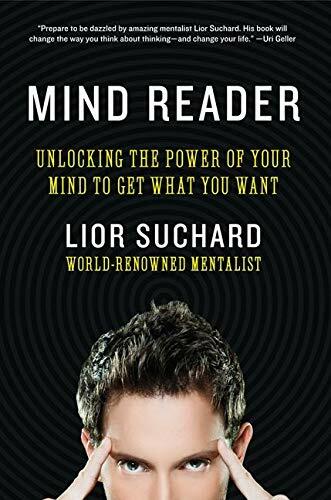 In Mind Reader, Suchard celebrates the extraordinary capacity of the mind and shares secrets from his own performances and life stories, as well as from psychological studies. His creativity-boosting techniques enable readers to embrace their inner mentalist-and harness untapped mental powers to create positive change in their day-to-day life. Filled with illusions, riddles, puzzles, and practical tips, Mind Reader will help you unlock the hidden powers of your own mind. Do you believe it's possible for someone to read your mind? Lior Suchard can. He can read your innermost thoughts, and knows what you are going to say before you say it—before you even know you're going to say it! As a six-year-old boy in Haifa, Israel, Lior first realized he had an extraordinary mental power. Now he is known throughout the world as a dazzling entertainer and peerless mentalist, astounding audiences everywhere with his singular talent for mind reading, thought influencing, and telekinesis. In Mind Reader, Lior takes us on an incredible journey through the wonders of the human mind, sharing his remarkable personal story while offering invaluable advice. Lior's secrets and lessons, illustrated throughout with interactive elements and brainteasers, will enable readers to achieve phenomenal success by unlocking their untapped mental powers and freely embracing their inner mentalist.